Having issues with my 02 f4i. About a month ago went to ride and battery was dead so I push started it and about 10 miles down the road it died on me and it wouldn’t push start. Got a new battery and it was fine. Last week the same exact thing happened. Went to take the battery out and it was swollen and bulging. Battery was only 2/3 weeks old, yesterday I went on a ride it was about 30 miles round trip and bike sputtered and died. Battery was dead when I tried starting it and even tried running and popping clutch did nothing. Went and bought a new battery put it in and it’s cranking but won’t start. Checked my fuses in my fuse box there all good. Checked the Fi fuse and it was blown. Put another 20a fuse in there turned ignition on and it blew the fuse right away, unplugged the rectifier from the stator and the stator plug was burnt. Checked the stator with ohms black on engine and red on the stator plug wires none moved (ignition off) so I put red on a wire and black on a wire and did that to all 3 wires and they all said 0.6 ohms. any ideas what’s going on? Tight on money so I want to make sure I buy the right part. And it’s my daily driver so I need her running ASAP. Please and thanks for any information. Also the battery showed 12.4v with ignition off. What's the charging voltage? The swollen battery is a sign of overcharging. Did the fi fuse blow after the regulator was unplugged? 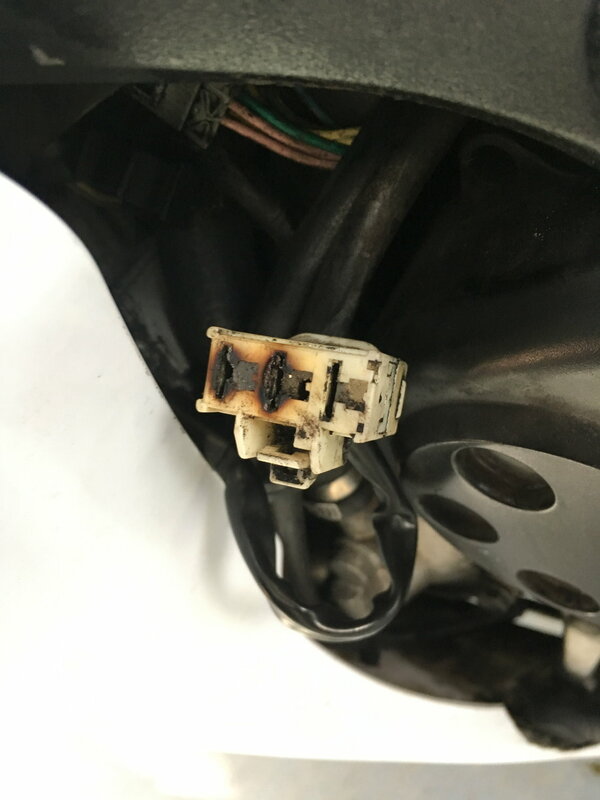 no the Fi fuse was blowing before I even startin inspecting anything... last night I realized it was blown out a new one in turned on ignition and the new one blew right away. Today is wen I took off rectifier and seen the burnt stator plug. So, what's the charging voltage? see if it blows with the r/r disconnected. If it still blows,then you have a short somewhere. also didn’t hear the fuel pump priming anymore. That’s probably because that fuse was blowing. You don’t think that burnt stator plug would be the short? So how I test charging voltage? You would need to get it up and running first. Then it as easy as putting your meter on the battery and taking it to 5k rpms. No your RR/stator wouldn't blow the 20amp FI fuse. 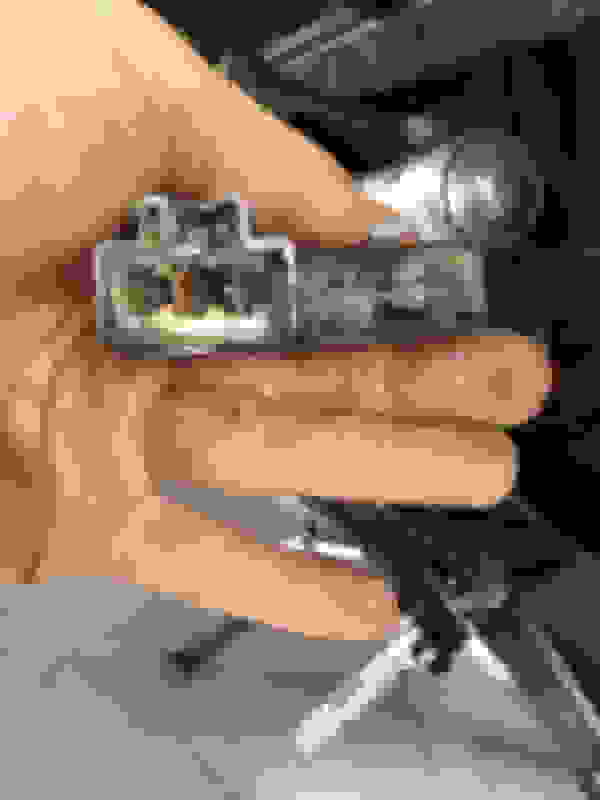 That fuse gives power to both the engine stop relay, and the fuel cut relay. from there, those two relays then power the fuel pump, the ignition coils, the injectors, your "exhaust air injection solenoid" aka the thing above the valve cover thats connected to your large breather tubes, and it also sends power to the ECU. If your bike is a california model, or a 2006, those relays would also power your o2 sensor and evap purge control. That said, the fact your stator/rectifiers plugs shorted out, and sounds like your bike was receiving too mch voltae for some period of time, that had to have ried something amongst those components I just listed. Your best course of action would be to forget about the stator/rectifier at the moment, disconnect them. Then you need to go through process of elimination to see what is causing the fuse to blow. Unbolt your gas tank and lift it a little and support it so you can access beneath it. You need to disconnect four plugs under the gas tank, then test one plug at a time to see which one pops your fuse. Those plugs are the Fuel pumps 3 wire plug, the 10 pin grey plug that leads to power your injectors on the throtlte bodies, and a black 6 pin plug that powers the ignition coils, and a two pin plug leading to your exhaust air inject solenoid. Then just test with one at a time plugged in, tell you find which one is blowing the fuse. Last edited by Towlieee; 10-07-2018 at 11:02 PM. Quick Reply: Need urgent help. Bike is my daily driver.